GitHub "social coding" is a web-based hosting service for projects that use the Git revision control system. Source code can be downloaded, browsed, checked in (committed), merged, forked, and monitored. SonATA and several other setiQuest open source software projects are hosted at GitHub. The SonATA repository at GitHub uses the Fork + Pull Model. This means that potential contributors first fork a copy of the master setiQuest/SonATA code base, make modifications to their local copy, then they issue a pull request for their modifications to be accepted into the master code base. The core-setiQuest developers with commit access will then decide whether to accept or reject the pull request. Here is a network graph that shows the activity of the SonATA repository. Here are some setup steps and git commands to get you started using the GitHub source code control system. Create a GitHub account (username) and setup the SSH keys. Go to https://github.com/setiQuest/SonATA and press the Fork button to create your own personal SonATA code branch on GitHub. From a Linux shell do git clone git@github.com:username/SonATA.git to download a local copy of your code branch. You'll need to replace "username" with your GitHub user name. For syncing with the main setiQuest branch do git remote add upstream git://github.com/setiQuest/SonATA.git to create a remote link. Modify or create a file and then push it to your SonATA fork on GitHub. Request that your changes be committed to the main setiQuest branch by pressing the Pull Request button on the GitHub website. Your modifications are now in limbo (an uncertain period of awaiting a decision or resolution). The setiQuest commit team will review your changes and possibly accept them. git log --graph --full-history --all --color --pretty=format:"%x1b[31m%h%x09%x1b[32m%d%x1b[0m%x20%s" a colorful text-base graph of changes. See image on the right. Install EGit and from Eclipse clone your repository. All Git commands are accessible by selecting the project and pressing the right mouse button -> Team. 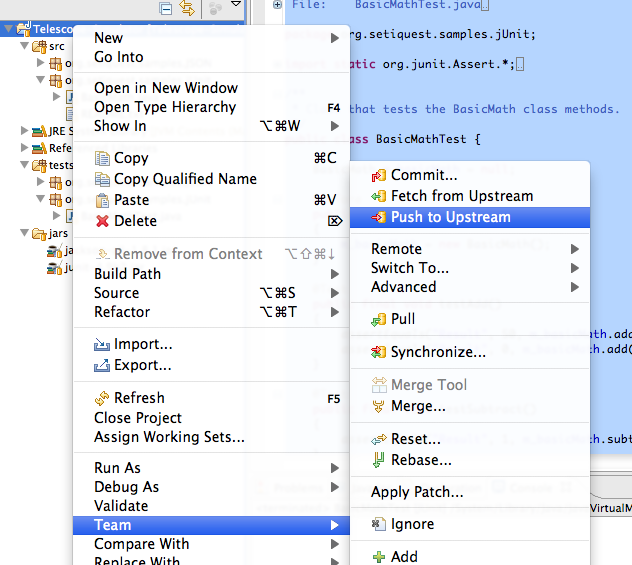 "Push to Upstream" is actually a standard "push". So remember, you commit, then push. http://www.viget.com/extend/i-have-a-pull-request-on-github-now-what/ this is a very simple example of how one person handles pull requests.